A ghost from the old Soviet space program may return to Earth in the coming years. Mimicking a campy episode of the 70s series The Six Million Dollar Man, a Soviet Venus lander stranded in Earth orbit will eventually reenter the atmosphere, perhaps as early as late 2019. Fortunately, this isn’t the “Venus Death Probe” that the Bionic Man Steve Austin had to defeat, but Kosmos 482 is part of a fascinating forgotten era of the Space Age and one you can track down in the night sky, with a little skill and patience. A renewed era of space exploration is underway. Compared to the Space Race of the 20th century, which was characterized by two superpowers locked in a game of “getting there first”, the new era is defined predominantly by cooperation and open participation. One way in which this is evident is the role played by “citizen scientists” and amateur astronomers in exploration missions. Consider the recently-released short film titled “A Journey to Jupiter” by Peter Rosen – a photographer and digital artist in Stockholm, Sweden. Using over 1000 images taken by amateur planetary photographers from around the world, this film takes viewers on a virtual journey to the Jovian planet, showcasing its weather patterns and dynamic nature in a way that is truly inspiring. The images that went into making this video were collected by over 91 amateur astronomers over the course of three and a half months (between December 19th, 2014 and March 31st, 2015). After Rosen collected them, he and his associates (Christoffer Svenske and Johan Warell) then spent a year remapping them into cylindrical projections. Rosen then added color corrections, and stitched all the images into a total of 107 maps. Much like fast-motion videos that illustrate weather patterns on Earth, or the passage of the stars across the night sky, the end result of was a film that shows the motions of Jupiter’s cloud belts and its Great Red Spot in high-resolution. Some 250 revolutions of the planet are illustrated, including from the equatorial band, the south pole, and the north pole. “A Journey to Jupiter” was also Rosen’s contribution to the Mission Juno Pro-Amateur Collaboration Project, of which he is part. Established by Glenn Orton of NASA’s Jet Propulsion Laboratory, this effort is one of several that seeks to connect amateurs and professionals in support of space exploration. Back in May of 2016, this group met in Nice, France, for a workshop dedicated to projects and techniques related to Jupiter observations. Still-pic from Rosen’s “A Journey to Jupiter” video. Credit: Peter Rosen et al via Youtube. Among other items discussed was the limitations that missions like Juno have to deal with. While it is capable of taking very-high resolution images of Jupiter, these images are highly specific in nature. And before a team of mission scientists are able to color-correct them and stitch them together to create panoramas, etc., they are not always what you might call “visually stunning”. However, Earth-based observatories are not hampered by this restriction, and can take multiple images of a planet over time that capture it as a whole. And thanks to the availability of sophisticated telescopes and imaging software, amateur astronomers are capable of making important contributions in this regard. And far from these being strictly for scientific purposes, there is also the added benefit of public engagement. Of course, this does not detract from the scientific value that this film has. For example, it showcases the turbulent nature of Jupiter’s atmosphere in a way that is scientifically accurate. 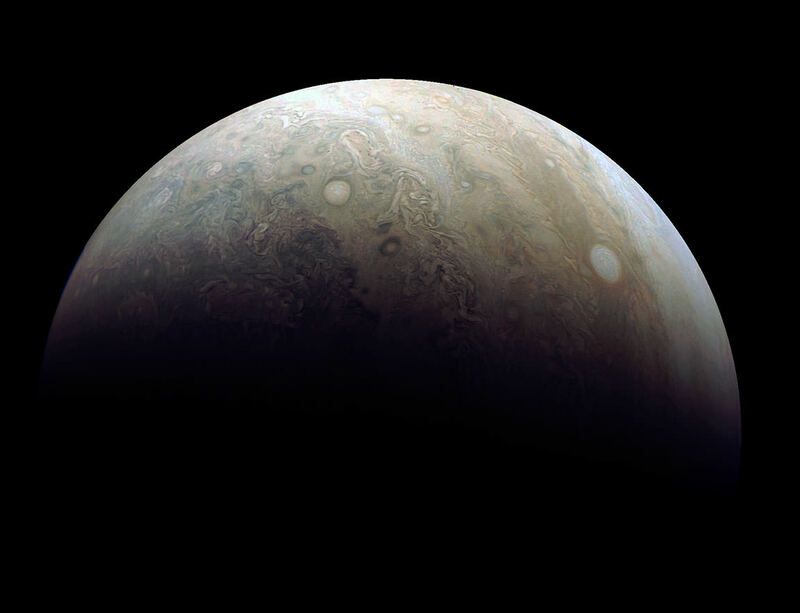 Hence why Ricardo Hueso Alonso – a physicist at the University of Basque Country and a member of the Planetary Virtual Observatory and Laboratory (PVOL) – plans to use the maps to measure Jupiter’s wind speeds at different latitudes. On top of its artistic and scientific merit, “A Journey to Jupiter” also serves as a testament to the skill and capability of the today’s amateur astronomers and planetary photographers. And of course, it draws attention to the efforts of space missions such as Juno, which is currently skimming the clouds of Jupiter to obtain the most comprehensive information about the planet’s atmosphere and magnetic field to date. Not surprisingly, this is not the first film by Rosen that combines scientific accuracy and fast-motion visuals. The short film Voyager 3, released back in June of 2014, was an homage by Rosen and six other Swedish amateur astronomers to the Voyager 1 mission. As the probe made its 28-day final approach to Jupiter in 1979, it snapped what were the most detailed images of Jupiter at the time. These images helped to improve our understanding of the gas giant, its atmosphere, and its moons. Among other things, hey revealed the turbulent nature of Jupiter’s atmosphere, and that the Great Red Spot had changed color since the Pioneer 10 and 11 missions had flown by in 1973 and 74. Produced 35 years later, Voyager 3 was an attempt to recreate this historic event using images taken by Swedish amateur astronomers using their own ground-based telescopes. Over the course of 90 days, Rosen and his colleagues captured one million frames of Jupiter, which resulted in 560 still images of the planet. These were then stitched together using a series of software programs (Winjupos, Photoshop CS6, Fantamorph, and StarryNightPro+) to create a simulation that gives the impression of a probe approaching the planet – i.e. like a third Voyager mission, hence the name of the film. It is an exciting time to be alive. Not only are a greater number of national space agencies taking part in the exploration of the Solar System; but more than ever, citizen scientists, amateurs and members of the general public are able to participate in a way that was never before possible. To view more work by Peter Rosen, be sure to check out his page at Vimeo.